We want all of our patients to feel relaxed and comfortable during their visit. We have Internet access for our patients, waiting family or friends to access if they wish. During your visit we have music, blankets and headphones to keep you comfortable. 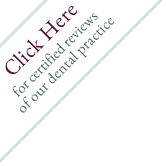 Please let us know if there is anything we can do to make your dental visit with us as positive as possible.